Phoenix Extreme Park it is an adventure park situated at 15 km southeast from the city centre of Bucharest, near the forest and Cernica lake. It is a good destination for families with kids, includes 9 forest tracks suitable to different ages starting 6 years and other sports activities such as archery, fishing, paintball and a zip-line across the lake (800 m distance, the longest in Romania as they say). In the proximity of the adventure park you can find Phoenix Club, offering various leisure facilities and accommodation by the lake. 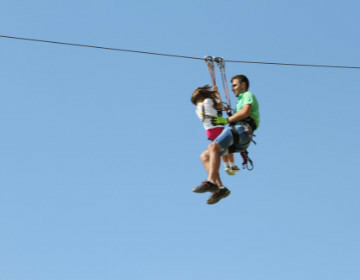 Locals in Bucharest have reviewd Phoenix Extreme Park Cernica - Kids attractions in Bucharest. You can find here description, reviews, address, map, phone, website of Phoenix Extreme Park Cernica in Bucharest. Visit Bucharest Tips for more Kids attractions in Bucharest!